The music of Journey has touched the lives of hundreds of thousands of listeners around the world for nearly thirty years. Since December of 1973, when former members of Santana and Frumious Bandersnatch united to form a San-Francisco based backup instrumental group called the Golden Gate Rhythm Section, through the addition of Hanford native lead singer Steve Perry in 1978, and on to the latest evolution of Journey with Filipino singer Arnel Pineda, the Journey fans of Ohio, Arizona, Brazil, Japan, and everywhere in between have remained faithful to the sound, the emotion, the magic, of Journey. This section of The Journey Zone contains a brief history of the band by album, a list of all recorded Journey albums, a list of released singles and top-forty hits, and album chart information. 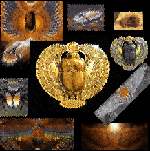 We hope that it will enhance your online Journey experience. Journey's first phase, as a fusion rock band, included the albums Journey (1975), Look Into the Future (1976), and Next (1977). The band's original lineup was Neal Schon and George Tickner on guitar, Ross Valory on bass, Gregg Rolie on piano and lead vocals, and Prairie Prince on drums. When Prairie Prince left the band prior to the recording of Journey, he was replaced by Aynsley Dunbar. Only one other personnel change took place during this era: George Tickner left the band after the first album to pursue a career in medicine. Following the recording of Next, which endured slumping record sales, the band moved in a new direction, hiring frontman/lead vocalist Robert Fleischman. But like Prairie Prince before him, Fleischman would never record a Journey album. He was replaced by Steve Perry and the band moved into its second era, blending their hard-driving fusion-oriented past with R&B-influenced pop stylistics. This era saw three original albums released in the United States: Infinity (1978), Evolution (1979), and Departure (1980). Aynsley Dunbar was replaced on drums after Infinity by Steve Smith. On each of the three albums during this era, Steve Perry shared lead vocal duties with Gregg Rolie. During the Rolie-Perry era, Journey released a compilation of their first three albums, In the Beginning (1980), recorded the soundtrack to the 1980 Japanese motion picture Dream, After Dream, (1980), and cut a live album, Captured (released 1981). In 1981, Gregg Rolie left the band and was replaced by pianist/songwriter Jonathan Cain, who added what the band needed for a long Journey in the top forty. This era saw the production of four studio albums: Escape (1981), Frontiers (1983), Raised on Radio (1986), and Trial by Fire (1996). Following the release of Frontiers, the band released a full-length feature film on VHS/Beta entitled Journey: Frontiers and Beyond, which chronicled life on the Frontiers tour. While there were no enduring personnel changes during this era, Ross Valory and Steve Smith were replaced by temporary band members during the recording of Raised on Radio. This era also saw the band endure a decade-long hiatus between the release of Raised on Radio and Trial by Fire, during which time the members of Journey pursued other projects. Following the release of Trial by Fire, Steve Perry left the band, ostensibly for medical troubles, and Steve Smith departed as well. During the decade-long hiatus following the release of Raised on Radio, Journey released their Greatest Hits in 1988 and the Time (Cubed) box set in 1992. They released Greatest Hits, Live in 1998, a compilation of songs recorded live during the Escape and Frontiers tours; The Essential Journey, a new compilation, was released in October, 2001. In 1998, Perry and Smith were replaced by Steve Augeri and Deen Castronovo. 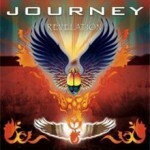 The new Journey was heard for the first time on one cut from the Soundtrack to the 1998 major motion picture release Armageddon called "Remember Me." The band released Arrival in Japan in October of 2000 and, with some modifications, in the U.S. in April of 2001. 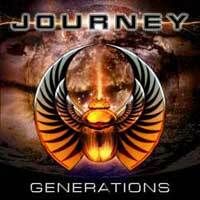 Then, in December of 2001, following an incredible summer tour which included opening acts John Waite and Peter Frampton, the new lineup released Journey 2001, a full-length feature DVD/VHS recording of their December 30, 2000 performance at Mandalay Bay Event Center, Las Vegas, Nevada. At selected shows during their 2002 "Under the Radar" Tour, they distributed an EP-4, Red 13, which was released commercially that Fall with new cover art designed by a fan. FInally, in 2005, the band released Generations, which featured each member of the band on lead vocals for at least one song. In 2006 Steve Augeri left the band and was briefly replaced by singer Jeff Scott Soto who, like Robert Fleischman before him, never recorded with the band. Guitarist Neal Schon found Filipino singer Arnel Pineda during a YouTube search. In December, 2007, the band announced that Pineda would be the new lead singer. The band introduced Pineda in February, 2008 in Chile, then released the Revelation double album, which included one disc of new material (the exception being the song "Faith in the Heartland," which had appeared on Generations, and one disc of re-recorded Journey classics, with Pineda singing Steve Perry's lines. The band toured that summer with Heart and Cheap Trick. 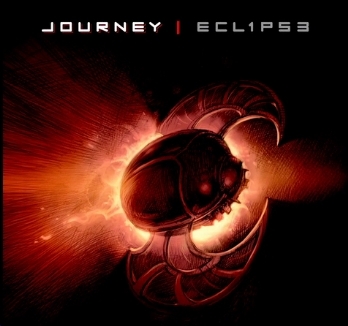 And in 2011, Journey released Eclipse.